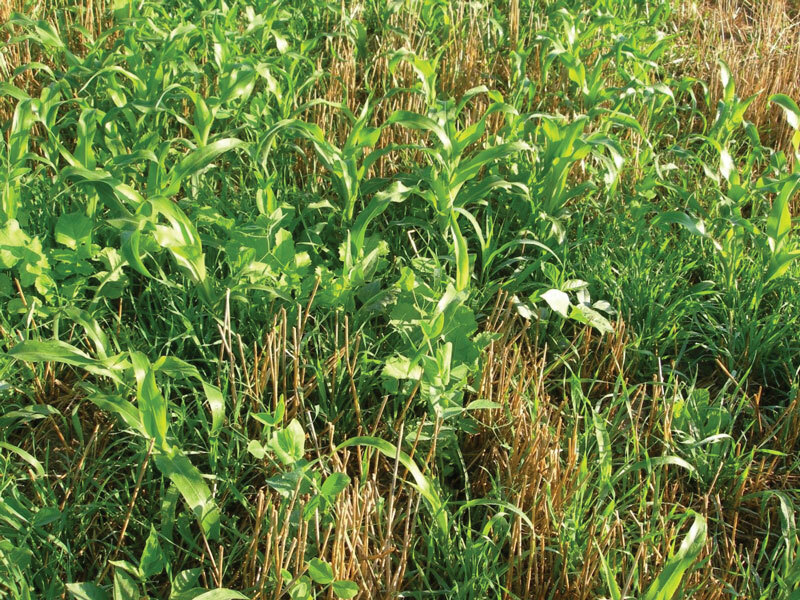 The Annual Forage Insurance Plan offers an opportunity to manage precipitation risk. Photo Courtesy of Jerry Volesky. Planting annual forages following a primary crop or specifically for feed can provide a number of benefits, including ground cover and forage resources for livestock. One of the main risks with this production practice, especially in a non-irrigated field, is variable precipitation and soil moisture conditions. The Annual Forage Insurance Plan, available in Nebraska from the USDA – Risk Management Agency (RMA), is one tool available to crop and livestock producers to help mitigate this risk. The Annual Forage Insurance Plan coverage is for annual forages seeded for use as livestock feed or fodder. This includes annual forage plants seeded for grazing, haying, grazing/haying, grain/grazing, green chop, grazing/green chop, or silage. The Annual Forage Insurance Plan now includes four growing seasons that cover the entire year. The sign-up deadline for all of these growing seasons is July 15 each year so producers interested in obtaining this insurance should contact their crop insurance agent in early summer to see what they need to do to get the coverage in place and what it might cost them. The Annual Forage Insurance Plan coverage is based off of precipitation index data provided by the National Oceanic and Atmospheric Administration Climate Prediction Center (NOAA CPC). Producers can insure from 70 percent to 90 percent of the Expected Grid Index precipitation across a series of two-month intervals spanning the coverage period for each growing season. Both irrigated and non-irrigated acres are insurable. Each county in Nebraska has a County Base Value determined by the RMA that represents its annual forage productive value regardless of production method. Annual Forage Insurance Plan premium costs will vary depending upon the coverage selected. Producers interested in using the plan are encouraged to access the decision support tool on the RMA website to explore various coverage options, premium costs, and performance data based on historical rainfall indices. Premium costs are subsidized from 51 percent to 59 percent depending upon coverage level selection. Catastrophic (CAT) coverage is available for the Annual Forage Insurance Plan. In general, it is hard to justify purchasing it unless a person has a lot of acres to cover within a particular county and is only protecting against a prolonged dry period. CAT coverage is fixed at 65 percent coverage on precipitation for the entire growing season, as one six- to seven-month interval. The productivity factor is fixed at 45 percent. Soil moisture at the time of planting annual forages as well as precipitation during the growing season is one of the primary drivers in the expected yield. Rainfall during germination and early growth is key for annual forages that require shallow planting because of small seed size. Adequate rainfall during the periods when these annual forages are growing rapidly is also critical. Producers utilizing the plan and choosing which two-month intervals to insure should evaluate how soil moisture and timing of precipitation would impact the annual forage crop that is being insured. Maximizing insurance coverage in the two-month intervals when precipitation would have the greatest impact on forage production would be logical. For producers considering utilizing the Annual Forage Insurance Plan in Nebraska, one of the greatest challenges in using the product is the timing of the sign-up period for purchasing the insurance. The deadline for buying the insurance is July 15 for the next crop year. Many producers who plant annual forages especially in the spring and summer will often have not identified the specific number of acres or crops that they plan to plant this far in advance. Producers planting annual forages in the spring and summer who have long-term cropping plans will be best positioned to utilize this risk management tool. Producers interested in using the Annual Forage Insurance Plan are encouraged to contact their local crop insurance agent and visit the Annual Forage page on the USDA Risk Management Agency website to access more information, including a grid locator, decision support tool, and all of the historical rainfall indices. A NebGuide, G2300 Precipitation Risk Management for Annual Forages is available as a resource on the Annual Forage Insurance Plan. You can also view a webinar explaining the insurance here. This material is funded in partnership by USDA, Risk Management Agency, under award number RM17RMEPP522C004.